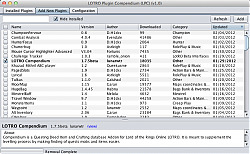 LOTRO Plugin Compendium (LPC) is a utility application to assist in installing and updating lotro LUA plugins. 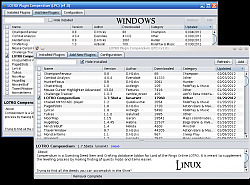 It attempts to take some of the leg work away from user having to manually download, create folders, and unzip download. 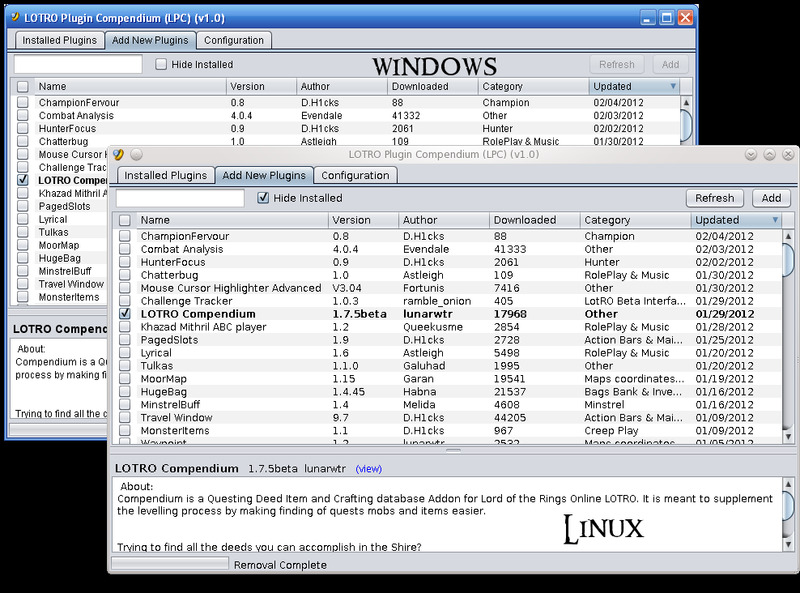 This application is an attempt to automate a manual process and help make things easier for LOTRO users. That said, if it does not work right, please report it below. I take no responsibility of it does not work on your PC or messes things up. I would, however, like to know about any problems you encounter so future versions can be fixed. in plugin description xml feed shows escaped characters. Fixed an issue with redirection of urls for api listing & downloads not being properly followed. Updated compression library to latest as they discontinued older one used. distribution for 1.2 was not properly updated. fixed bug where prior version wasn't getting displayed correctly for plugins that were already installed. Implementation of JAXB-API has not been found on module path or classpath. Running MacOS 10.13.6 with appropriate Java runtime. The reason i ask, is because there is "Outdated LotRO Interfaces" category here, but there are some plugins there that are working perfectly fine, and also some that have not been updated for a while or not working, are not there. It would be nice to be able to filter only 'working' plugins, but of course that would require community to flag them. Preferably dynamically. how do you determine which plugins are outdated, or what outdated means? On a basic level, I like the idea of just adding additional ways a user can filter the UI to more easily find what they wish to install. I agree that "outdated" might mean different things. I think the most helpful for users would be if LPC could idenify which ones no longer function upon installation. I am unsure whether that is currently documented or flagged effectively on lotrointerface. This would involve the community identifying which addons work or don't work. For example we might, in the same manner LPC uses a feed to manage the plugin list, another feed could be used to track the list of non-working addons. Another is we could solicit lotrointerface to add that kind of feature / classification for admins to flag. Is there any possibility to have a checkbox that allows hiding outdated plugins? Sounds like a great enhancement! I submitted a new version for people to test. The problem is being caused by redirection of the plugin feed. For now, please go to the "Configuration" tab, and change the "Plugin Feed Url"
Then the problem should go away. Problem while retrieving plugin lising "null"
Thank you for letting me know. I am getting the error as well on linux. So I just tried downloading the latest version of the compendium for my mac (from what I can tell according to the dates time stamped on the file links) and I'm getting "JREloaderror" when attempting to open the file under the Mac folder. I am currently running Mac OS High Sierra version 10.13.6. Any help would be much appreciated! P.S. I've also tried other versions just to see if those would work and I am being presented with the same error. I want to be able to use the Bootstrap menu to show/hide plugins after they have been launched. This works with PredictInGameTime, but not with LotroPad or Compendium. Is there a way for me to fix that? UI Skins are not supported, but plugins have to be explicity reviewed for compliance and added to the list. If I overlook and miss any, I rely on the community to give me a heads up. Thank you very much for informing me of UserChatter. It should now be added. Last edited by Calion : 04-07-2018 at 08:29 AM. 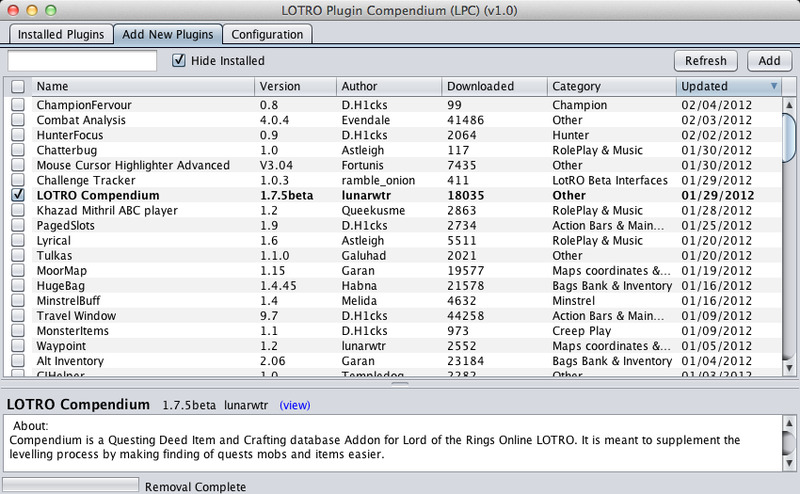 I've noticed (in the Mac version) that some plugins are not accessible from within PluginCompendium. Specifically, UserChatter and Delving Hills. Is this deliberate for some reason, or is something going wrong?